Mogi: name of PDF was named "Khuraldai". I'm assuming the new notes are being called as such. Lucid Issuer in an email said the Exchange Offer Memorandum is only available for noteholders. Upon the terms and subject to the conditions set forth in the exchange offer memorandum dated February 20, 2017 (the "Exchange Offer Memorandum"), the Government of Mongolia (the "Government") is offering to exchange (the "Exchange Offer") up to US$580 million of Development Bank of Mongolia LLC's ("DBM") outstanding 5.75% Guaranteed Notes due 2017 (the "Old Notes") for the Government's new debt securities (the "New Notes"). Capitalized terms not otherwise defined herein shall have the same meaning as in the Exchange Offer Memorandum. THE EXCHANGE OFFER WILL COMMENCE ON FEBRUARY 20, 2017 AND EXPIRE AT 5:00 P.M., CENTRAL EUROPEAN TIME, ON MARCH 1, 2017, (SUCH DATE AND TIME, AS THEY MAY BE EXTENDED OR EARLIER TERMINATED AT THE SOLE DISCRETION OF THE GOVERNMENT, THE "EXCHANGE EXPIRATION DATE"). Copies of the Exchange Offer Memorandum describing the Exchange Offer may be obtained from Lucid Issuer Services Limited (the "Information and Exchange Agent"), at the addresses, website and telephone numbers set forth below. February 21 (Frontera News) Not all is well with Mongolia (AZIA). Growth in the economy has tumbled with commodity prices, which account for over 90% of its export earnings. The economy's GDP grew at just 1% in 2016 due to, a) commodity price decline, and b) slowdown in China demand for copper (JJC) (CPER) and coal (KOL). Meanwhile, the nation's debt has been burgeoning, reaching $23 billion as of 4Q16. At a time when Mongolia's banks threaten an economic crash, the Hong Kong-based Asia Frontier Capital is invested in the region. Thomas Hugger, chief executive officer, and founder of Asia Frontier Capital, a firm dedicated to investing in the Asian frontier markets (FRN) (FM), has maintained portfolio exposure to Mongolia for many years. "We see the light at the end of the tunnel," Hugger recently told Frontera. Hugger spoke about three key reasons for his belief in this frontier market's long-term prospects. Following a five-year slide (2011-2016), copper prices finally began to recover in early 2016. Over the past one year, the shiny metal's price has surged 28.7%, with mining giants such as Anglo American (NGLOY), BHP Billiton (BHP), Glencore (GLNCY), and Rio Tinto (RIO), expecting it to rise further as excess supply seems to have come off the market. Moreover, the government initiated stimulus programs in China; which consumes 40% of world copper; have also contributed to the metal's resurgence. 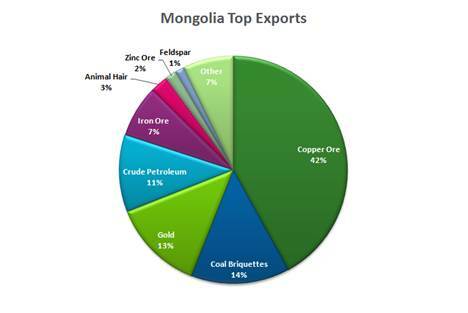 Copper ore accounts for 42% of Mongolian exports. Mongolia is ranked 12th in the world for copper reserves. The south Gobi Desert alone has an estimated of 35 million tons of copper. UK-based Central Asia Metals (CAML.L) and Rio Tinto (RIO), Canada-based Entrée Gold Inc. (EGI), Turquoise Hill Resources Ltd. (TRQ), and Erdene Resource Development Corporation (ERDCF) are among the foreign mining companies engaged in copper mining in Mongolia. 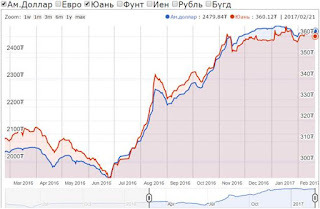 Coal, Mongolia's number 2 export (14% of exports), has followed a similar trajectory; a five-year slide followed by a quick recovery through 2016 and continuing. Australian thermal coal has recorded a whopping 68.8% price gain over the past 1 year alone. Foreign companies engaged in coal mining in Mongolia include Australia-based Aspire Mining Limited (ASPXF) and Hong Kong-based Mongolia Energy Corporation Limited (MOAEF). Hugger also expects the spat over Rio Tinto's (RIO) $5.3 billion Oyu Tolgoi copper and gold mine in Mongolia to resolve soon. Rio Tinto would then be investing a lot into the second phase of the Oyu Tolgoi mine, thereby opening up a huge additional source of foreign exchange for the nation. The economy has recently been able to secure a $440 million loan package from the International Monetary Fund (IMF) to ease the country's balance-of-payment pressures and support it's government's looming debt repayments. "The Asian Development Bank, the World Bank and bilateral partners including Japan and Korea are expected to provide up to another $3 billion in budget and project support, while the People's Bank of China is expected to extend its 15 yuan billion ($2.2 billion) swap line with the Bank of Mongolia for at least another three years," the IMF said in a statement on Sunday. The package is thus, a part of the $5.5 billion bailout envisaged for this frontier market. According to Citigroup, we may see Mongolia tapping the international markets pursuant to the IMF package. 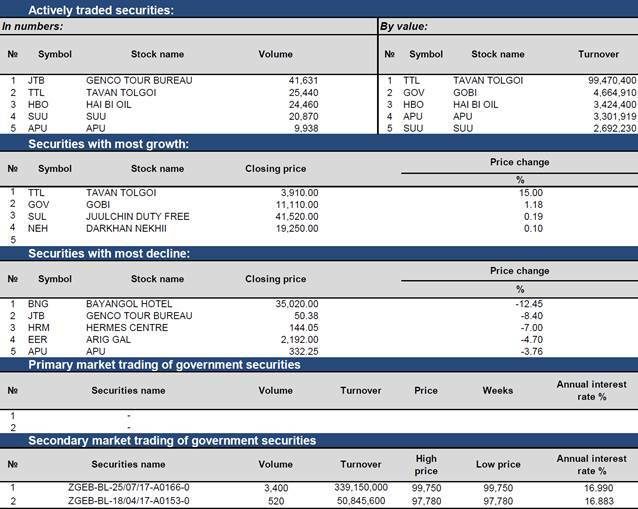 Ulaanbaatar, February 21 (MONTSAME) Tavantolgoi JSC, listed on the Mongolian Stock Exchange (MSE), has released its annual report for 2016. The company made revenue of MNT 176.5 billion, and net profit of MNT 54.04 billion in 2016. Tavan Tolgoi Joint-Stock Company (TT JSC), also known by the nickname "Little Tavan Tolgoi" not to be confused with Erdenes Tavantolgoi LLC, is one of the largest coal mining companies in Mongolia. Its name means "five hills," in reference to the unique topographical features of area where the Tavantolgoi coking coal deposit is located. TT JSC was established in 1966, when it received an order to "export 3000 tons of coal." Currently, the Mongolian government owns 51% of the company, and approximately 4% of the shares are floated on the Mongolian Stock Exchange. February 21 (Bank of Mongolia) Spot trade: Commercial banks bid weighted average rate of MNT2476.91 for USD2.2 million and asked weighted average rate of MNT2481.97 for USD26.5 million and bid weighted average rate of MNT354.15 for CNY27.0 million also asked weighted average rate of MNT361.7 for CNY12.0 million respectively. The BoM bought USD16.0 million with a closing rate of MNT2482.0. Swap and forward trade: The BoM received selling bid offers of USD20.0 million of USD swap agreements from commercial banks and the BoM did not receive any bid offers. February 21 (Bank of Mongolia) Auction for 39 weeks maturity Government Treasury bill was announced at face value of 50.0 billion MNT. Face value of 50.0 billion /out of 65.0 billion bid/ Government Treasury bill was sold at discounted price and with weighted average yield of 17.570 %. February 21 (Bank of Mongolia) Auction for 3 years maturity Government Treasury note was announced at face value of 5.0 billion MNT. Government Treasury bill was not sold due to absence of both competitive and non-competitive bids. Ulaanbaatar, February 21 (MONTSAME) Economic Partnership Agreement between Mongolia and Japan entered into force in June, 2016 and as a first result of the agreement trade turnover has been growing. "- Annual trade with Japan reaches USD300 million and the trade turnover of 2016 reached to USD344 million, grew up by 17 per cent compared to the previous year. Due to the Economic Partnership Agreement, Japanese businessmen's interest to study Mongolian business environment and investment Mongolia has been intensifying" said Director of the Foreign Trade and Economic Cooperation Department of the Foreign Affairs Ministry V.Enkhbold. Last year, several meetings were organized to introduce and discuss about what possibilities businessmen have in the framework of the agreement. For instance, business representatives of Hokkaido and Shizuoka prefectures of Japan came to Mongolia to hold business meetings. Mr. V.Enkhbold also highlighted an official visit of PM J.Erdenebat to Japan and an economic forum held during the visit. "- A contract was established between companies during the forum and dried milk processing factories will be established in every aimag. The Economic partnership agreement has started yielding positive results". We have discussed soft loan of RUB100b or US$1.5b. Russian side said it will resolve, only two sides need to agree on projects. Russian side also said it is watching IMF negotiations carefully. We are interested in implementing by these fund UB railroad, power projects. Also DBM is discussing US$200m loan from Russian bank. People's Republic of China also praised agreement in progress with IMF, noted it has significance for stable planning of cooperation. PRC will provide assistance through World Bank, Asian Development Bank and IMF. Ikon.mn news report: "Ц.Мөнх-Оргил: ОХУ-аас 1.5 тэрбум ам.долларын ХӨНГӨЛӨЛТТЭЙ ЗЭЭЛ хүссэн"
Ulaanbaatar, February 21 (MONTSAME) During its regular meeting on February 8, the Cabinet resolved to award the 'State Leading Herder' title to 103 herdsmen, 'State Best Herder' to 5 herdsmen, 'State Leading Dairymaid' to 5 dairymaids, 'State Leading Farmer' to 5 farmers, 'State Foremost Agrarian Group' to 12 agricultural entities and 'State Foremost Agrarian' to 21 people. These days, Members of Parliament and Cabinet are presenting the awards. On February 19, Sunday, Prime Minister J.Erdenebat worked in Selenge and Darkhan-Uul aimags to bestow the 'State Leading Herder', 'State Leading Farmer' and 'State Foremost Agrarian Group' titles to the recipients. On this day, the Prime Minister visited the homes of G.Ansai from Mandal soum, Ts.Bulgan from Bayangol soum and Kh.Baldandorj from Yuruu soum of Selenge aimag who were selected for the 'State Leading Herder' title. Moreover, 'Uglugchiin Kherem' LLC and agrarian B.Jargalsaikhan of Khongor soum of Darkhan-Uul aimag and 'Ikh Shinestei' LLC of Yuruu soum of Selenge aimag received their awards from the Prime Minister which include a medal, certificate and Mongolian Ger. On February 20, Monday, the Prime Minister worked in Tsagaannuur soum of Selenge aimag to present the prestigious awards. Ulaanbaatar, February 21 (MONTSAME) Today, February 21, longevity grant of MNT50-250 thousand starts being distributed to seniors aged 65 and more. The grant is legalized to be given twice a year on national holidays Tsagaan Sar and Naadam Festival. Seniors aged 65-69 are entitled to get MNT50, 70-79 will receive MNT 80 thousand and 80-89 will receive MNT 150 thousand and elders above 90 will receive MNT 250 thousand. The Minister of Labor and Social Protection calculated that a total of 121 thousand seniors will receive the grant and MNT20.5 billion has been allocated in the state budget for it. February 21 (LehmanLaw) The Previous Mongolia Arbitration Law consisted of 43 clauses while the newly revised Arbitration law consists of 52 clauses. The new Mongolia Arbitration Law is drafted to be mostly based on the previous Arbitration Law with a few key changes. Take action to preserve evidence which is significant for the resolution of the dispute or otherwise related to the dispute. 4. there is a reasonable possibility that the dispute may be resolved positively for the Party requesting the temporary action. If the arbitration panel considers that informing one party of the request for Temporary Action submitted by the other party, the panel may do so. The party so notified will have the opportunity to provide arguments relating to the request for Temporary Action. The arbitration panel may request the Party requested the temporary actions, to provide appropriate financial guarantee in relation to the said actions. This is a positive change to the Arbitration Law which will give Arbitration more "teeth" and better ways to be effective at both resolving disputes and securing an appropriate compensation for a grieved party seeking redress. Our experienced Mongolia lawyers are excited at the new options provided by this change the Arbitration Law and we are looking forward to see these Temporary Actions take effect in our own cases. Summary: Minister of Foreign Affairs Ts. Munkh-Orgil is currently visiting China on an official visit at the invitation of Chinese Minister of Foreign Affairs Wang Yi, to discuss cooperation between the two countries and to regional and international affairs. The two sides agreed to organize the first Chinese-Mongolian forum on minerals, energy, and infrastructure, the scheduling of PM J. Erdenebat's visit to China, and agreed upon the mechanisms of the second parliamentary meeting of the two countries being held in the near future. The two sides also agreed to cooperate on increasing the amount of agricultural imports from Mongolia, and to take action to increase economic partnership. The Chinese side reported that Mongolia has ratified the agreement to use Chinese territories to transport goods by ocean, and that China will assist Mongolia. It was also announced that China is ready to sign a currency swap agreement. Summary: The Law of Mongolia on Pledges over Moveable and Intangible Property is set to take effect on March 1. In order to fully implement this law, the Ministry of Justice and Internal Affairs, International Finance Corporation, the Intellectual Property Rights and State Registration Office, Bank of Mongolia, and other organizations have cooperated to establish an online database for the registry of movable property and information regarding collateral for intangible assets. During the launch ceremony for the database, Vice Minister of Justice and Internal Affairs B. Enkhbayar noted that the database will benefit citizens greatly and that by implementing this law, a new lifeline for the economy will be added and new opportunities will arise in the business sector. Information in the database will be available to the public, and registered information will become official records of assets and collateral. Summary: The Ulaanbaatar Chamber of Commerce and the Ulaanbaatar Governor's Office organized the Ulaanbaatar Investment 2017 forum. Ulaanbaatar Mayor S. Batbold stated, "The main goal of this forum is to develop the economy, private-public partnerships, and to give the private sector room for growth." S. Batbold noted that 677.5 billion MNT will be invested in the city's development this year, and the majority of the capital (353 billion MNT) will go toward infrastructure upgrades. Foreign loans and grants will make up 359.8 billion MNT and the city budget, concession agreements, and funds from Development Bank of Mongolia will make up 319.3 billion MNT of the required capital. The governor introduced his plans to further develop the city's infrastructure and plans to develop ger districts. S. Batbold noted that bureaucracy in public offices will be limited and that efforts will be made to improve transparency to create a favorable environment for the private sector. 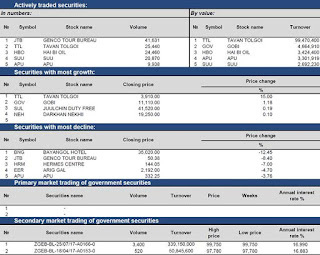 Summary: Mongolian Stock Exchange listed Tavan Tolgoi has published their 2016 financial report. In 2016, Tavan Tolgoi had sales revenue of 176.5 billion MNT, a seven-fold increase compared to 2015. The increase in commodity prices positively affected the company's bottom line, and Tavan Tolgoi earned 4.2 billion MNT in profits due to currency exchange rates. In total, the company had 54 billion MNT in profit. Increased commodity prices positively affected many mining companies in Mongolia. Erdenes Tavan Tolgoi exported 7.65 million tons of coal and plans to export 11.5 million tons of coal in 2017. Three hundred thousand tons of coal is set to sell for 71.5 USD per ton at the Baruun Tsankhii mine. Mongolia Mining Corporation successfully restructured its debt and is selling coal for around 120 USD per ton. MAK exported 5.4 million tons of coal in 2016 and is selling their coal for 340 CNY per ton. Summary: The Mongolian Stock Exchange (MSE) earned revenue of 1.17 billion MNT in 2016, a decrease of 26% compared to last year. The MSE lowered its operating expenditures but still operated with a loss of 1.64 billion MNT in 2016. The MSE announced that losses before taxes had decreased by 27% compared to 2015, and that taxes paid decreased nine-fold in one year, with 1,38 million MNT in taxes paid. After taxes, the MSE operated with a loss of 1.64 billion MNT. February 21 (gogo.mn) Just after the Tsagaan Sar celebration, the Eagle Festival is announced to be held on 05 March, 2017 at the Chinggisiin Khuree tourism camp, located in the Bogd Khan National Park. It is the event for those who can't travel over 1300 km to the westernmost Mongolia to see the Eagle Festivals at take place in September (Altai Eagle Festival) and October (Golden Eagle Festival) in Bayan-Ulgii province. This amazing festival attracts many including those who made it big in Hollywood such as Michelle Rodriguez. Tickets for the event is 10,000 MNT per person, includes transportation. For more information and reservation please contact the organisers at 976-99101727, 95951727, 99151656. February 20 (UB Post) NOUS Events Company will hold its first 6:45 series lecture and meeting of 2017 on February 22 at Chinggis Khaan Hotel. D.Nyamsambuu, head of Javzandamba Khutagt Center, a Mongolian humanitarian organization dedicated to improving the spiritual and mental wellbeing of the society, will present a lecture titled "Morality in Buddhism" at the event. When: February 22, 6:45 p.m.
February 20 (UB Post) Margarita Day is celebrated every year on February 22. Cosy Club will celebrate Margarita Day with customers. A margarita is a cocktail which consists of tequila, liqueur and lime or lemon juice, served with salt. When: February 22, 8:30 p.m.
February 20 (UB Post) Nogoon Tagt Restaurant will hold its next Movie Night on February 23. 2016's American supernatural horror film "Ouija: Origin of Evil" will be screened this time. The film focuses on a widow and her family adding an Ouija board to their scamming business where they invite a spirit that possesses the youngest daughter. When: February 23, 8:00 p.m.
February 21 (news.mn) Mongolian Foreign Minister Ts.Munkh-Orgil is visiting Beijing at the invitation of his Chinese counterpart, Mr Wang Yi. On 20th of February, Ts.Munkh-Orgil concluded an agreement with Foreign Minister Wang Yi. During the meeting, the two sides agreed to organise a visit of the Prime Minister of Mongolia to Beijing, a second Mongolia-Chinese parliamentary meeting and a first cooperation meeting on Energy, Mineral and Infrastructure. China has also extended he swap agreement with the Mongolian Central Bank and signed an agreement on transit transportation for sea freight. Ulaanbaatar, February 21 (MONTSAME) Minister of Foreign Affairs of Mongolia Ts.Munkh-Orgil is on an official visit to the People's Republic of China at the invitation of his counterpart Wang Yi. On February 20, Monday, the Foreign Minister met with three officials - Li Yuanchao, Vice President, Fu Ying, Chairperson of the Foreign Affairs Committee of the National People's Congress and Gao Hucheng, Minister of Commerce. Vice President Li Yuanchao expressed his confidence that the visit by Mongolia's Foreign Minister will contribute to strengthening mutual political trust and progressing bilateral ties. In return, the Foreign Minister noted that developing friendly relations with China is a main direction in Mongolia's foreign policy, and that Mongolia attaches a great significance to bilateral strategic partnership. He invited the Vice President to pay a visit to Mongolia at his convenience. During the meeting with Chairperson Fu Ying, sides agreed that the establishment of a regular parliamentary exchange mechanism between Mongolia and China was crucial to cooperation between the law-making bodies of the two countries, and a joint meeting of the mechanism should be held in the near future. Foreign Minister Ts.Munkh-Orgil and Commerce Minister Gao Hucheng exchanged views, and agreed on enforcing Mongolia-China trade and economic cooperation, carrying through agreements reached on high level, organizing a meeting of the working group of Mongolia-China intergovernmental commission, intensifying the task to establish a joint border region, accelerating the implementation of projects funded by non-refundable aids and soft loans, and organizing trainings and seminars under Silk Road Fund and Asian Infrastructure and Investment Bank. The Chinese side expressed its readiness to work towards expanding bilateral financial ties at this time of economic difficulty in Mongolia. February 21 (China Daily) China extended its support to Mongolia on Monday for overcoming economic difficulties, as Foreign Minister Wang Yi announced a number of measures to help the debt-ridden neighbor. Observers said that since the bilateral ties are emerging from a time of political frustration, Beijing's latest help is a sincere move to assist the landlocked neighbor to diversify its economy. The measures include providing assistance and favorable loan terms to Mongolia and extending a bilateral currency swap deal that is vital to Mongolia's foreign trade and currency stability, according to a joint news conference after Wang's talks with his visiting Mongolian counterpart Tsend Munkh-Orgil on Monday. The International Monetary Fund said on Sunday that the country has agreed to implement an economic rescue package proposed by the IMF and refinance bond loans, easing concerns that Mongolia might default on a loan in March. China supports the aid by international financial institutions to Mongolia, and it will also consider Mongolia's hope to expand exports of mineral, agriculture and husbandry products to China, Wang said. Since Mongolia is trying to avoid missing a $580 million sovereign-guaranteed debt repayment due in March, the IMF said in its statement on Sunday that the Asian Development Bank, World Bank and bilateral partners, including Japan and South Korea, will provide up to $3 billion in aid. People's Bank of China, the central Bank of China, will extend a currency swap line to Mongolia worth 15 billion yuan ($2.18 billion), while the IMF said it will offer three-year loans worth about $440 million, Agence France-Presse reported. Mongolia angered China in November by allowing a visit by the 14th Dalai Lama, who has pushed for separating Tibet from China. In January, during a phone call between Wang and his Mongolian counterpart, Mongolia said it had reflected deeply on the visit and promised to not allow the Dalai Lama to visit again. On Monday, Wang said the bilateral relationship "is ready for another start". Munkh-Orgil, the Mongolian foreign minister, said his country remains true to the one-China policy and Tibet is part of China. Additionally, Mongolia appreciates China's help in addressing economic problems, he said. He added that Mongolia's prime minister expects to visit China in May to attend the Belt and Road Forum for International Cooperation. Xing Guangcheng, a senior researcher on Russian and Central Asian studies at the Chinese Academy of Social Sciences, said the helping hand was offered at a time when Mongolia has fixed the trouble brought by allowing the Dalai Lama's entry, which "pushed on China's bottom line". Zhang Jingquan, a professor on Northeast Asian studies at Jilin University in Changchun, said the measures announced by Wang on Monday "are meeting the desperate need" of Mongolia. The country could take the improvement in bilateral ties as an opportunity to diversify its conomy and change its inefficient development pattern, Zhang noted. February 21 (Global Times) Forecasts by some observers that emergency aid from the IMF is likely to help Mongolia pull through its economic crisis might appear to be overly optimistic. The country's current crisis is the combined result of both external factors and an unbalanced economic structure, which is an incentive for Mongolia to speed up its domestic reforms. China will most likely be willing to provide more assistance to help the neighboring country push its economic reform forward, but it remains uncertain whether Mongolia will accept. The IMF package may be accompanied by additional support from China as the country's central bank is expected to extend a currency swap line to Mongolia worth 15 billion yuan ($2.18 billion), easing concerns that Mongolia might default on sovereign-guaranteed debt in March. The IMF package would buy time for the debt-ridden nation to take a breath, but an international bailout cannot solve the fundamental problems that have caused Mongolia's current economic crisis. The nation is expected to slash its budget deficit and adopt a set of fiscal reforms after receiving the IMF package, but such efforts might not be enough to restore debt sustainability. Mongolia's heavy dependence on the export of mineral resources makes the nation sensitive to commodity price fluctuations and at risk economically. In light of these problems, Mongolia has to carry out reforms to optimize its industrial structure, of which a key step will be improving economic efficiency. China is willing to share its experience on how to promote economic diversification and investment efficiency it has had in resource-rich areas such as North China's Inner Mongolia Autonomous Region. Hopefully Mongolia will follow China's advice. It may even be worth considering setting up a mechanism to invite Mongolian grassroots officials to visit China in a bid to learn from the country. Mongolia would benefit if its economy were more closely tied to China's rise. Lying between China and Russia, Mongolia has strived to remain politically and economically independent. It is understandable that Mongolia may have some concerns of getting too close to China, but the overall development of Sino-Russian relations creates a sound atmosphere for enhancing China-Mongolia cooperation and the crisis-hit nation should seize this opportunity. China's aid to Mongolia is unlikely to be limited to emergency financial assistance but would include deep economic cooperation based on mutual political trust. Mongolia needs to show its sincerity for enhancing bilateral ties and pushing forward reforms. ASTANA, February 21 (TCA) — Kazakhstan and Mongolia have pointed out some areas for cooperation in geological exploration, uranium mining and processing, and expressed interest in implementation of joint projects in the nuclear sector, Kazakhstan's national atomic company Kazatomprom said on February 21. During a visit to Mongolia, the Chief Executive Officer of Kazatomprom Askar Zhumagaliyev met with the Chairman of the State Great Khural (Parliament) of Mongolia Mr. M. Enkhbold, the Minister of Mining Industry of Mongolia Mr. T. Dashdorj, General Secretary of the Nuclear Energy Commission of Mongolia G. Manlaijav, and the executive director of the state-owned company MON-ATOM D. Dalaijargal. The parties discussed prospects for nuclear cooperation of the two countries. "Today Kazakhstan ranks second in the world as to uranium reserves. 21 percent of the world's uranium production accounts for Kazatomprom, and Kazatomprom is the leading supplier of natural uranium to the world market, covering about 20 percent of global requirements in natural uranium," said Zhumagaliyev. On January 10 Kazatomprom announced that due to the prolonged recovery in the uranium market, planned 2017 production from Kazakhstan will be reduced by approximately 10 percent (3 percent of total global uranium production). The decision was based on a strategic review of the current oversupplied uranium market, the company then said, adding that even with these reductions, Kazatomprom will continue to lead global uranium production and support the growth of nuclear energy around the world. YEREVAN, FEBRUARY 21, ARMENPRESS. Foreign Minister of Armenia Edward Nalbandian and Foreign Minister of Mongolia Tsend Munkh-Orgil on February 21 exchanged messages on the occasion of the 25th anniversary of the establishment of diplomatic relations between the two countries, press service of the Armenian MFA told "Armenpress". The Armenian FM said in his message that the mutual partnership between the two countries serves as a firm base to further expand and strengthen the friendly relations through joint efforts. Foreign Minister of Mongolia in his message expressed confidence that the traditional friendly relations and cooperation between the two countries will further develop and deepen in sectors of mutual interest for the benefit of the two peoples. Ulaanbaatar, February 21 (MONTSAME) On February 16, Ts.Jambaldorj, Ambassador Extraordinary and Plenipotentiary of Mongolia to Italy presented his diplomatic credentials to Marino Riccardi and Fabio Berardi, Captains Regent of the Republic of San Marino. Ahead of the ceremony to present credentials, the non-resident Ambassador to San Marino Ts.Jambaldorj and Simone Celli, Minister of Finance and acting Foreign Minister of San Marino and Ambassador Ts.Jambaldorj made remarks on the bilateral relations and cooperation between Mongolia and San Marino respectively. Following the ceremony, Captains Regent Marino Riccardi and Fabio Berardi received Ambassador Ts.Jambaldorj. At the beginning of the meeting, the Mongolian Ambassador conveyed a greeting from Ts.Elbegdorj, President of Mongolia to the Captains Regent of San Marino. Ts.Jambaldorj pointed out the 10th anniversary of diplomatic relations between Mongolia and San Marino being marked this year. Mentioning that the two countries have possibilities to intensify bilateral relations and collaboration in the fields of trade, economy, culture and education, the Ambassador expressed his readiness to work towards the development of bilateral ties in all spheres in the future. JOINT BASE SAN ANTONIO-FORT SAM HOUSTON, Texas -- (Feb. 21, 2017) Contract support by the Mission and Installation Contracting Command's 615th Contracting Team at Joint Base Lewis-McChord, Washington, is serving to enhance Mongolian disaster preparedness and response by multinational civil and military authorities. Gobi Wolf is a reoccurring disaster response exercise and exchange mission in Mongolia to enhance operational emergency response plans, regional partnerships and support for response to natural disasters in the region. The exercise focuses on refining the readiness to respond to various hazard situations common to Mongolia through field exercises, problem-solving sessions and presentations followed by a detailed after-action review. This year, Gobi Wolf will center on significant secondary effects of fires, mining accidents and disease outbreaks as a result of an earthquake. U.S. Defense Department participants include the I Corps in conjunction with the U.S. Army Pacific and Alaska National Guard. Aligned to support I Corps in this effort is the 902nd Contracting Battalion's 615th CT. Capt. Jerry Andes, the team lead, began coordination of contract support of certain services and supplies in support of the exercise last month with I Corps civil affairs engagement officials. Master Sgt. Troy Orio-Dettling is a civil-military operations planner for I Corps who is serving as the exercise NCO in charge. He said Gobi Wolf is one of many disaster relief exercise and exchange missions in the Pacific area of responsibility to help forge partnerships and capacity building. "Without contract support for the next DREE, support to the host nation, multinational organizations and agencies, and ourselves will hindered," Orio-Dettling said. "In-short, no contracting support will have a negative cultural impact." Andes added that the contracted services and supplies by the 615th CT will support approximately 20 U.S. personnel participating in the exercise. Coordination is underway to determine the extent of contract support for additional exercise participants. "Several items such as vehicles, interpreters, food service, bottled water and printing are the types of support being requested," Andes said. "At this point, all of the other typical exercise support requirements are being provided by the Mongolian government." In addition to DOD involvement, U.S. participants also taking part include the U.S. Agency for International Development, Federal Emergency Management Agency, Army Corps of Engineers and Forest Service. Together with the Mongolian National Emergency Management Agency, Mongolian armed forces and industry leaders, stakeholders aim to foster enhanced interagency communication and coordination, and civil-military interoperability. Multinational participants include China, Columbia, Nepal, India, Pakistan, Japan, South Korea, Philippines, Bangladesh, Canada, Australia, the United Kingdom and New Zealand. "The end state for this exercise is to continue to develop a theater setting solution that enables U.S. forces and our partner nations to rapidly respond to contingency and crisis events in Mongolia and the Pacific Command area," said Lt. Col. Toney Stephenson, commander of the 902nd CBN and deputy director of the MICC-JBLM contracting office. Planning will continue for exercise over the next three months. An initial site survey was conducted at the end of January in preparation for a contract requirements review. Andes will take part in the final site survey March 13-17 as well as travel to Mongolia at the end of April in support of Gobi Wolf that takes place May 1-5 in its capital of Ulaanbaatar and Umnogovi Province. Ulaanbaatar, February 21 (MONTSAME) Parliament Speaker M.Enkhbold received Sergey Levchenko, Governor of Irkutsk region of the Russian Federation on February 17, Friday during his visit to Mongolia. At the beginning of the meeting, Speaker M.Enkhbold wished success to his visit, and said, "Mongolia-Russia ties have been intensifying in every sector with Russian President Vladimir Putin's visit to Mongolia and signing of a medium-term Strategic Partnership agreement in Ulaanbaatar". While mentioning about Mongolia-Russia Cooperation-2016 forum and his visit to the Russian Federation last December, the Speaker noted the importance of developing closer trade and economic ties and co-realizing large-scale projects and programs, emphasizing on the role to be played by Irkutsk oblast, being in geographical proximity and having a rich history of good relations. For his part, Governor Levchenko invited Speaker M.Enkhbold to Irkutsk in connection with the upcoming 80th anniversary of the Irkutsk region. He also informed that Irkutsk has opened its Investment Agency under the recently established Trade Representative Office of the Russian Federation in Ulaanbaatar. The Irkutsk delegation led by the governor included authorities of about 25 enterprises from the province who held talks with their Mongolian partners. The Governor also mentioned about his meeting with Prime Minister J.Erdenebat, and a Mongolian-made products expo which will be held in April in Irkutsk. Furthermore, Governor Levchenko highlighted two areas of utmost importance during their meeting. The first issue was cooperation in energy sector; "We are aware that Mongolia seeks to realize large-scale energy projects and we are ready to partake and assist in these activities", he said. Secondly, the Governor identified tourism as a main area of cooperation between the two countries. "We have agreed to establish a travel route between Baikal and Khuvsgul Lakes. But due to lack of adequate road connecting the lakes, the project isn't showing progress. Therefore, we see that Russia-Mongolia Intergovernmental Commission should focus on the road issue", he said. The Governor also said that he will make efforts directed at organizing the intergovernmental commission's 2017 meeting in Irkutsk, requesting the Mongolian Speaker's assistance on this issue. During the meeting, Governor Sergey Levchenko presented an Investment Passport of Irkutsk region to Speaker M.Enkhbold, saying, "The passport encompasses a list of major projects and programs to be realized by Irkutsk in the next few years. I am sure that Mongolian projects will be included too. I am confident that organizing investment and economic forums will help expand bilateral cooperation in trade and economy. With closer relationship between Irkutsk and Mongolia, the bilateral ties between our countries will be advanced". Speaker M.Enkhbold then expressed his readiness to support joint industries, investment projects and other activities between Mongolia and Irkutsk oblast. February 21 (Pakistan Defence) Where is that $1 billion Modi promised to Mongolia? China has just bailed out Mongolia, with the IMF contributing more. Other Asian countries such as Japan and South Korea are also standing by to help. Where is India in all this? I thought Modi called Mongolia a "friend". Is this how Modi and India treat a friend? Or is this yet another example of Indians making big promises they can't fulfill? China's central bank has agreed on a currency swap agreement with Mongolia worth US$2.2 billion, according to a joint statement released by the International Monetary Fund (IMF) and Mongolia on Sunday. The deal - part of a $5.5 billion bailout - will last for three years, and can be extended upon agreement on both sides. Based on the agreement, Mongolia can trade in its own currency with China at a pre-determined exchange rate, a move it is believed could help the East Asian nation increase its foreign exchange reserves and strengthen the Tugrik. Economic growth in Mongolia slowed to around one percent last year due to a fall in commodity prices and a slowing economy in China, though the IMF has estimated that the bailout should see economic growth hit eight percent by 2019, SCMP reports. It marks the sixth time since 1990 that the IMF has bailed out the country. In addition to China's financial support, the IMF will provide a loan of $440 million, while Asian Development Bank (ADB), World Bank, Japan and South Korea are also planning a "rescue package" of $3 billion. Thereby hangs a sordid tale of how the cookie crumbled in the steppes; how the itinerant dream merchant fed false hopes to a credulous but friendly and trusting people; and, how Mongolia -- when squeezed by China to apologise for the Dalai Lama's visit and promise to never again invite him -- learned the hard way that India would neither come to its aid nor deliver on its promises. Beijing made Ulaanbaatar kowtow, and that was a resounding slap on New Delhi's face. Our story begins in May 2015. PM Modi travelled to Ulaanbaatar from China, told people in the land of Genghis Khan of Buddhism in India, and of Buddhism, among other civilisational links, being common to India and Mongolia. He also announced a credit line of $1 billion and assured the Mongolian leaders that India would extend support in diverse fields and increase exports to Mongolia. This was the text. Pictures showed PM Modi patting a Mongol horse and trying his hand at archery – the symbolism of posing with a bow and arrow aimed unmistakably at Beijing. That underscored the subtext. PM Modi's billion-dollar pledge came as a big boost to Mongolia, which is locked between China and Russia, and overwhelmingly dependent on the former. Time was when Mongolia was in a clover, with the Russians and Chinese competing to win them over; and, Mongolia could leverage its ties with one power for bargaining with the other. If Moscow failed to respond to a felt need, Ulaanbaatar could always seek Beijing's help; and vice versa. Lately, that has changed. Russia and China have become allies and Russia too is more dependent on China as the greater power especially in the aftermath of the US-led sanctions triggered by the retaking of Crimea. As a result, Ulaanbaatar can no longer call on the Kremlin to help when Beijing is uncooperative. A poor country, with a GDP of about $ 35 billion, Mongolia now feels "trapped" between Russia and China, particularly with the Belt and Road Initiative (BRI) as the only show in the region. This brings us to the subtext of PM Modi's visit: For New Delhi, it was a successful foray into "China's backyard". It was also a message to Beijing that should it seeks to step up its 'presence' in Sri Lanka -- which is India's "zone of influence" – then it should be prepared to face India in its own backyard. In fact, the $1 billion pledged by Modi was India's answer to the few billion dollars China was pouring into Sri Lanka. The Mongolian leadership saw PM Modi's visit as the arrival of a "new power" that would be a counter to China. It was led to believe that it would enjoy India's support in standing up to China. Indian support, Ulaanbaatar felt, could be critical in the event of Chinese pressure becoming unbearable at a time when Russia can no longer come to its rescue. The Prime Minister's visit gave rise to new expectations of economic as well as geopolitical gains. Mongolia naively saw India as a strategic friend that could help Ulaanbaatar stand up to Beijing. This sense of strength and support which the Monglians (mistakenly) perceived they were drawing from India was palpable when I visited Ulaanbaatar in July. To be Indian was special. After all, Mongolia was expecting a billion dollars from India. "When will this credit line start flowing," was a question that men, and women, who matter kept popping at me. I had not the heart to disabuse them of their hopes and expectations, when they saw me as the one who had come down from the elephant which is out to slay the dragon. The crisis erupted in November 2016. The Dalai Lama, perhaps encouraged by New Delhi, went on a four-day visit to Mongolia. This was his ninth trip to a place where he is revered, and his photo is kept in many monasteries. China resented this provocation, objected to the Dalai's visit and warned Ulaanbaatar against hosting him. Ulaanbaatar, confident of India's support, defied Beijing to receive the Dalai Lama. China struck swiftly with an unprecedented economic blockade. The sanctions paralysed Mongolia's economy and trade. China slapped a levy on Mongolian goods and trucks entering China. As Russia is too tied to China, Mongolia turned to India, and asked for the promised one billion dollars. Ambassador Gonchig Ganbold, who met Ministry of External Affairs (MEA) officials, told a leading English daily: "It's important that India raises its voice against the unilateral measures China is taking against us which is hurting our people especially when severe winter is upon us." Silence, he said, could be construed as giving China a "pass" for its behaviour." The MEA spokesman's response was: As a close friend of Mongolia, which India regards as its 'third neighbour' and 'spiritual neighbour', we are ready to work with the Mongolian people in this time of their difficulty. However, Modi Sarkar was in a funk. There was no trace of the muscle the Prime Minister had displayed to much applause in Ulaanbaatar in May 2015. Any action to ease Mongolia's difficulties would have meant inviting China's wrath. Predictably, the political leadership turned a deaf ear to Mongolia's desperate plea for help. As a result, on December 21, Ulaanbaatar apologised abjectly to Beijing. Mongolian Foreign Minister Tsend Munkh-Orgil promised that the Dalai Lama will no longer be allowed to enter his country. Ulaanbaatar fell in line and Beijing resumed the stalled talks for a loan of $4.2 billion. Without China's financial assistance, the Mongolian economy would collapse. It is game, set and match to Beijing. This was an entirely avoidable fiasco arising from sheer misjudgment on the part of Mongolia, the Dalai Lama and the Government of India. The launch of UNFPA-supported report "Why Mothers Died", focuses on recommendations to address maternal mortality in Mongolia. February 21 (UNFPA Mongolia) On February 16, 2017, the national dissemination meeting of the Maternal Mortality Review was held at the National Center for Maternal and Child Health (NCMCH). UNFPA Country Representative Naomi Kitahara gave the opening speech, which precluded the launch of the official report entitled "Why Mothers Died". This is the fourth review of the case series and covers the period from 2012-2015. In her speech, Ms. Kitahara reiterated UNFPA's global mandate to reduce maternal mortality, especially the critical importance of gathering quality data. Specifically, quality data gleaned from the "Confidential Enquiry for Maternal Deaths," an internationally-recognized methodology for assessing maternal mortality. "The Confidential Enquiry is, by design, an approach aiming at improving the health system and the quality of health care by collecting data, identifying shortfalls in health service provision, and suggesting recommendations," she said. "It forms a basis for key policy and technical-level decisions needed to avert maternal deaths." Findings of the review highlighted a decrease in maternal mortality cases from 151 to 118. The direct and indirect causes were registered as 52.5 % and 46.3% respectively in the current study, which showed no significant difference from the past review (54.3 &amp; 44.4%). The main, direct causes of maternal mortality were identified as Septic condition (24.2%), Hemorrhage (17.7%) and Preeclampsia (17.7%). On this basis, the report provided the following key recommendations: 1) the need for urgent in-depth review of sepsis cases as well as changing the prevailing antibiotics administration regimen to strengthen the current obstetric infection management protocols to meet the international guidelines and standards; 2) improving the skills of the health care service providers and the quality of antenatal care, with particular attention to critical elements of antenatal care such as quality rapid testing, a functional referral system, and outreach programs with health education and counseling services. It was emphasized that these should all be made available at no cost to poorer segments of the population. As Mongolia now looks towards the global targets set by the Sustainable Development Goals in 2030, specifically in achieving good health and wellbeing for all, these recommendations have become even more crucial if it hopes to replicate its past successes. "It was a proud achievement for Mongolia to be one of only 9 countries in the world in 2015 which met the maternal mortality reduction target of the Millennium Development Goals," says Ms. Kitahara, "However, the recent increase of the maternal mortality ratio by almost two-fold indicates the fragility of Mongolia's health system and its vulnerability to external shocks, including economic difficulties which the country faces today. In addition, the effect of violence against women and girls, and especially violence by intimate partner, should not be forgotten, as it is contributing to maternal deaths, and this has to be explored more deeply in the future studies." Further, the review provides solid data, which could serve as the basis for policy and programme development and implementation. "Globally, we know strong family planning programmes, strengthened emergency obstetric and newborn care (EMONC), and enhanced skilled birth attendance are key to reduce maternal mortality. Mongolia has done well in ensuring skilled birth attendance, but needs to continuously improve the quality of emergency obstetric and newborn care and recalibrate its approach to family planning," Ms. Kitahara says. She goes on to emphasize the rationale behind policy and programme environment with a strong family planning agenda at its core goes far beyond ensuring the health of individuals, but addresses a universal principle. "Family planning is a human right, and modern contraceptives must be available for women in need to avoid any unwanted pregnancies. Health care providers should have good counselling skills in family planning, and strong political will is essential to secure sufficient state funding for contraceptives." She concluded her speech with continued confidence in the Mongolian government's ability to overcome the present challenges in the realm of maternal mortality." It is my firm belief that through the leadership of the Ministry of Health and NCMCH, backed by a deliberate, concerted allocation of the right levels of financial and human resources, a replication of past success in the reduction of maternal mortality is more than achievable in Mongolia." With UNFPA's commitment to be a partner to the Government of Mongolia in this endeavour, assurances were given to fulfill UNFPA's mandate: to deliver a world every pregnancy is wanted, and every child birth is safe. "Mothers do not need to die, giving birth," declared Ms. Kitahara. And the more when there is known about maternal mortality in Mongolia through such undertakings as this report, taken seriously by government through supportive policies and programmes. February 21 (Subtech Sports) On 15th of April the two engineer students Louis-Marie and Francois will be packing their car with school material to drive 25.000 km thru Europe and the middle east to help support building schools in Mongolia. Their goal is to raise funds for the association EDUCATE in order to build one new school and thereby contribute to help build up the society by educating the young children of Mongolia. We are proud to support Le Mongolfrech to protect their gear on their long journey to Mongolia and wish them the best of luck on their preparations. Ulaan Baatar, February 21 (news.va) - While the Catholic Church in Mongolia in 2017 celebrates its silver Jubilee, the community is celebrating the ordination of Bernard Kambala, a member of the Congregation of the Immaculate Heart of Mary , ordained a priest on February 19 in the Cathedral of Saints Peter and Paul in Ulaanbaatar. The community of the baptized in the land of Genghis Khan had celebrated the priestly ordination of the first Mongolian priest, Father Joseph Enkh in August 2016. "They are gifts that ensure the future of the Church in Mongolia", says to Fides Bishop Wenceslao Padilla, CICM, Apostolic Prefect of Ulaanbaatar. The Bishop in his message for the New Year wrote: "2017 is for us a promise of great joy: the Silver Jubilee of the Catholic Church in Mongolia and two Priesthood ordinations: deacon Bernard Kambala Muana, CICM, and deacon Antonius Werun, Salesian". These priests and missionaries will give "new impetus to our community". "The Congregation of the Immaculate Heart of Mary, which also celebrates the 25 years in Mongolia, is pleased that the Lord still sends out laborers for his vineyard and shows us his benevolent face", notes Padilla. Bernard Kambala, a native of the Democratic Republic of Congo, joined the CICM congregation in 2005. After three years of philosophy studies and one year of novitiate in Kinshasa , he studied theology at Ecole théologique Saint Cyprien de Ngoya in Ngoya, in Cameroon until 2013. Once he arrived in Mongolia in August 2014, he studied the Mongolian language and dedicated himself to the knowledge of the local culture. He carried out his pastoral service in the church of St. Peter and Paul in Ulaanbaatar. Since January this year Fr. Bernard has begun publishing a daily meditation on the Word of God, writing in Mongolian, a fact much appreciated by the faithful,As the motto of his ordination, Fr. Bernard chose the words of St. Paul to the Romans: "God proves his love for us: while we were still sinners Christ died for us" . There are more than 50 missionaries and religious from 14 countries in the world, in Mongolia. The Catholic community has over one thousand Mongolians baptized and hundreds of catechumens present in 6 parishes and three mission stations are expected to be erected to the rank of parishes on the occasion of the Jubilee celebration. Ulaanbaatar, February 21 (MONTSAME) 'Anhaar', an application to educate the public with entertainment lessons of disaster-risk management was released. The application includes guidelines and emergency service numbers to be used in a disaster or accident. By informing an important knowledge such as first-aid instructions through an entertaining method, the app provides invaluable knowledge to reduce disaster risk. The application was developed by the collaboration between the National Emergency Management Agency, United Nations Development Programme in Mongolia and Batu Digital co.,ltd. The application is available on Google Play Store and Apple Store. February 21 (NEWSER) – It may rhyme with "dud," but it packs a deadly wallop: A dzud (pronounced 'ZUHD) is an extreme weather phenomenon unique to Mongolia that's characterized by a summer drought and then a prolonged winter of heavy snow and temperatures of minus 40 to minus 59 degrees Fahrenheit. A dzud typically happens once every 12 years, but it has struck for the second consecutive year this winter, and it's putting the livelihoods of more than 150,000 nomadic herders and family members at risk. The dzud last year killed more than 1 million livestock, which are the only source of food, transport, and outside income for almost half of Mongolia's population of 3 million, the Red Cross said last week, as it launched an emergency appeal. More than 40,000 cows and other livestock have already died this time, a figure that's expected to jump in the freezing months ahead and into spring when animals are still weak. Many herder families will lose their livestock and livelihoods "and will have no choice but to migrate to the slum areas on the outskirts of [the capital, Ulaanbaatar] and other urban centers where they will face great social and economic hardship," said the head of the Beijing office of the International Federation of Red Cross. The Red Cross said 70% of the country is covered by snow, and 157,000 people belonging to herder households in 17 of Mongolia's 21 provinces are at risk. The agency appealed for $650,000 to help 2,740 of the most at-risk families, reports the AP. Ulaanbaatar, February 21 (MONTSAME) A team headed by the Deputy Prime Minister, Mr U.Khurelsukh has been working these days in Bayan-Ulgii and Uvs provinces. The team is visiting Bulgan and Sagsai soums, where the wintering conditions have worsened. Over two million livestocks are being overwintered in winter camps of 6,200 families in Bayan-Ulgii province. The team handed the reserved hay and animal fodder to the herdsmen of Bulgan and Sagsai soums. The government has granted 138 litres of livestock medicine and bio-supplies, 40 tons of hay free of charge and 40 tons of animal fodder with 50 percent discount, to relieve wintering difficulties in the above mentioned soums. As for Uvs, 2.7 million livestocks are being overwintered, and 13 soums have harsh wintering conditions. Extended meetings of emergency officials were held during the team visit to Turgen, Ulaangom and Naranbulag soums. The Deputy PM handed the government and international aid to the local administrations. The government has shown assistance of MNT 100 million and 138 litres of bio-supplies, 360 tons of hay to Uvs province. A total of 240 tons of fodder were provided with 50 percent discount. Including emergency trucks granted to five soums, the amount of aid for wintering has reached MNT 570 million. Ulaanbaatar, February 21 (MONTSAME) The VIII edition of '2017 Asian Winter Games' is taking place in Sapporo and Obihiro, Japan from February 19 to 26. In the men's Ice hockey game, Mongolian team has won a match against Thailand with 5:4 points which led to their next glorious victory of 8:0 points over Singapore. From the 32 countries that are participating in the competition, Mongolian team is scheduled to play against Thailand, Taiwan, Hong Kong, United Arab Emirates and Singapore in Group 'B'. Mongolian team's next match against United Arab Emirates is at 6:00PM on February 21. The Mongolian team consists of 42 athletes and is scheduled to compete in seven categories such as Alpine skiing, Biathlon, Cross-country skiing, Freestyle skiing, Ice hockey, Short track speed skating and Speed skating in this event. Ulaanbaatar, February 21 (MONTSAME) The world's most popular travel guide book Lonely Planet has included Mongolia in the List of Best Travel Countries for 2017 in its latest issue. Mongolia was described in the seventh place in the article with a headline "Ten destinations you cannot afford to miss". It said: "In 2017 Mongolia will raise the curtain on a brand-new capital-city airport, a state-of- the-art facility that symbolises the country's rapid modernisation. Ulaanbaatar has been the biggest beneficiary of the economic boom, its transformed skyline bristling with glass and steel towers. At the centre of this development is a US$500-million Shangri-La complex, which will be completed by 2017, featuring a 290-room hotel, an IMAX cinema and a Hard Rock Café. Beyond the capital lies Mongolia's stunning countryside, highlighted by Lake Khuvsgul, the Blue Pearl of Asia. In 2015 the lake was connected to Ulaanbaatar by paved road, cutting driving time by 10 hours". The head monk of Mongolia's oldest monastery, who will be joining a trip with Nomadic Expeditions this summer, offers a history lesson—and a few pearls of wisdom. February 21 (AFAR) The untouched landscapes and glimpses of nomadic life are reason enough to want to visit Mongolia. But there's a unique itinerary from Nomadic Expeditions this summer that could inspire you to put the country at the top of your travel checklist. Mongolia: Spiritual and Cultural Awakening is a rare look at the country's Buddhist roots, thanks to an illustrious pair of hosts: Tibet House founder and renowned scholar Robert Thurman, the first Westerner to be ordained as a monk by the Dalai Lama, and Mongolia-born Baasan Lama, the head abbot of Erdene Zuu, Mongolia's oldest monastery. On a two-week itinerary that will include central Mongolia and the Gobi Desert, the group will also stop at Erdene Zuu to meet Baasan Lama; they'll also take part in guided meditations with him at his own hilltop retreat. We asked Baasan Lama to give us a backgrounder on his country's complex relationship with Buddhism and to share his thoughts on the importance of compassion during even the most tumultuous times. This interview was translated in part by Jalsa Urubshurow, founder of Nomadic Expeditions. What makes Mongolia such a unique place to visit? Mongolia is beautiful and untouched. I've traveled the world and haven't found a place that feels more wild and spiritual. A lot of other countries are cutting down trees and killing animals and insects. That isn't happening as fast in Mongolia. What should we know about Buddhism in Mongolia? Mongolia has been a democratic country since 1990, so everyone can practice religion freely now. But during our 70-year socialist period, many monks were imprisoned or killed, and others hid or fled the country. A lot of people buried their Buddha statues, often in places like outhouses where nobody would go looking for them. Before communism, there were 100,000 monks and 2,000 monasteries. Today, there are around 3,000 monks and 250 monasteries. Wow—what was it like before 1990? Did you have any family members who were monks? I was born and raised near Erdene Zuu monastery, which was a museum because Buddhism was forbidden back then. My grandfather was a monk, and I remember when I was a child he had a secret room underground where he kept Buddhist sutras and thangkas. At midnight he'd go down there to pray and meditate. When did you decide to become a monk? It was when I visited Erdene Zuu for the first time, when I was 10 years old. I felt I was in a place that was really familiar. I felt at home there. I eventually became a monk in 1991, one year after the fall of communism. At that time, many of the older monks who lived under communist rule had already passed away. These days, you still see mostly younger monks. I became the head abbot of Erdene Zuu 10 years ago when I turned 30. You have to memorize a lot of text. When I first became a monk, it was a 40-minute walk between my home and the monastery, and on the way I'd memorize 12 rows of Sanskrit. We spend most of the day chanting, praying for the good of humanity, and there aren't really any days off. When I'm not at the monastery, I do volunteer work, and I also have a small school for young monks. Do you live at the monastery? None of us live at Erdene Zuu because it's still a museum and because most of it was destroyed. About 80 percent of the monks there are married—many of them were already married when they became monks after communism fell. It sounds like a tough transition. How do young Mongolians view Buddhism today? The next generation of Mongolians sees Buddhism as an old religion that their grandparents believed in. The rituals seem superstitious, and young people don't understand the meaning behind them. Because of this, Buddhism is on the decline in Mongolia. That's why I'm traveling and giving lectures. I focus on teaching about compassion and love, which is more universal, rather than the "ism" of Buddhism. I spoke to 20,000 people in Mongolia in the last year, and I also traveled to the U.S. and Europe to speak to Mongolians living abroad. Tell us about your monastery, which Nomadic Expeditions guests will be visiting. Erdene Zuu was built in the 16th century. It was the first monastery in Mongolia, and it's also the largest. It's just over 200 miles southwest of the capital, Ulan Bator, near Karakorum, the ancient capital city founded by Genghis Khan in the 13th century. Most of it was destroyed during communist rule, and only three of the 62 temple buildings survive. What do you want to teach the travelers you meet? If I can help people find love and compassion from within themselves, of course I'll be very happy. All of our suffering is dependent on our thoughts and emotions and anger, as well as our ego and self-centeredness. Meditation is what teaches you how to master these thoughts. If you don't have love or compassion inside yourself first, then you have nothing to give others. Society is made of families, and a family is made of individuals, so if you change yourself, your family will be changed, and then society will change, too. It's like getting on an airplane: You need to put your oxygen mask on first before helping the person next to you. February 21 (It's Nice That) In the past year, photographer John Feely has won a long list of awards from the likes of LensCulture and Capture magazine, many of them for his series The Outsider. Based on his experiences in Mongolia, where the Australian photographer now partly lives, the series is a lingering look at life in the vast, sparsely-populated nation. The Outsider is set in Mongolia, where you are now based. What drew you to the country? I went to Mongolia because I wanted to experience what was beyond my own plans, with the belief that perhaps there was a wisdom out there beyond my own need to control, expect and need certain things and outcomes. I chose Mongolia because I knew it was spacious and had traditional values. I literally chose a spot off a map because it looked the most remote and flew there. I did this because living in this way in Australia was not working out for me. It was my way of dealing with something more than a planned trip. The point of the trip was to put myself in a location so far from my realm of experience with no plan or expectation, so in a way everything that could happen was unexpected and beyond my own control. The title The Outsider refers to the people I stayed with, myself and my reasons for going to Mongolia. I try to document my own internal and external experience, my own journey and what draws me to a place as well. Internally I guess I discovered how transformative it is to not fill up the space with what we know and want, and instead embrace what is actually around us. Specifically how this opens up the world around us, gives us a new way to see. In some ways I learned a whole new way of living. I tried to express experiences and relationships rather than documenting the literal exclusively. How did you find your way around the notoriously under-populated country? Initially, I flew into a town in Western Mongolia with no plan thereafter. After a few days I met someone who spoke English and they organised for me to go 200km out of town and stay with a family. I had plans of travelling on horseback from there down the valley but after three days my horse got injured so I returned back to the family I was staying with. As was often the case, what seemed like a setback became something beyond what I had planned. The next day I ended up migrating across the country with the family's grandfather, his grandson and all of their animals, while the rest of the family moved their possessions. We ended up in their summer resting place and set up there for the summer. With this as a base I would sometimes travel around the region, often with Agali, the father of the family and now a very dear friend. Tell us about daily life in Mongolia. In 2014 and 2015, I was living with a family in the Altai Mountains in western Mongolia so I spent my time partaking in daily life there. This involved everything from sharing meals to rounding up wild horses in the mountains, migrating from place to place and climbing into eagles nests halfway down cliff faces. The people I stayed with did not speak the same language as me, so our communication was non-verbal. This has a notable effect on how I communicate with people and spend my time. Very strong relationships can be formed from this approach: it requires a lot of trust and can also lead to a lot of laughter. In some ways I guess the details disappear and you are left with a very pure form of experience. Last year, I spent six months working on a personal project in Mongolia. Since The Outsider I have become interested in what Mongolia is beyond my own notions of traditional living. Finding the physical spaces where the world I live in at home in Australia and my experiences from The Outsider intersect. I guess I am interested in how the ideas and practices from traditions can contribute to a new way of living in the future. I think sometimes we forget that tradition can also be part of progress. February 21 (Out of Office) It might not be the first country you think of for a holiday, but there is no reason why it shouldn't be. This Southern Asian country has more to offer than you think and we advise visiting sooner rather than later. With the newly built second international airport due to open this year, along with two swanky luxury hotels built in Ulaan Baatar, it is more accessible and appealing to those who want to travel in style. Its land mass is twice the size of France yet its population is less than a 20th of the UK's, this country is overcome with dramatic boundless landscape and natural beauty. From the vast flat plains, the labyrinth of rivers and snow covered mountain tops, wherever you look you are greeted with breathtaking scenery. Start in the capital city Ulaan Baatar and treat yourself to a few nights in one of the new lavish hotels. The rest of your trip will offer a very different experience. Immerse yourself in Mongolian culture in every way possible and stay in a ger, which is the traditional form of housing used by nearly 50% of the population still. These circular huts made out of felt and waterproof coverings are equipped with beautiful authentic furniture and house everything a Mongolian family need with the heart being centred around a warm cosy fire stove. Take a trip to Kharkhorin, which is known as the historic centre of the country. Here was where Genghis Khan built his empire which at its largest stretched from the Sea of Japan to Central Europe. He is to this day, a significant figure for Mongolians. Visit Orkhon Valley Cultural Landscape which has been named a Unesco World Heritage Site. One thing you will notice in Mongolia is the abundance of bird life that fills the clear blue skies. From eagles, hawks and falcons, you will see a vast variety of birds. Take a camel ride along the Yolyn Am gorge, a deep and narrow gorge in the Gurvan Saikhan Mountains in southern Mongolia. It is the untouched beauty which makes it so attractive. The extensive remoteness is a huge contrast to the hectic, busy lives we lead, and escaping to this place where you can look around and find no sign of human civilisation but incredible mountains, vast plains, stunning river beds and barren deserts is majestic. With new hotels and airports being built, now is the time to visit if you want to experience the true Mongolian way of life.